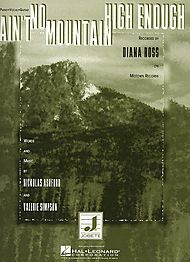 Ain’t No Mountain High Enough by Diana Ross. For Guitar, Piano/Keyboard, Vocal. Piano Vocal. Classic Soul. Difficulty: medium. Single. Vocal melody, piano accompaniment, lyrics, chord names and guitar chord diagrams. 8 pages.